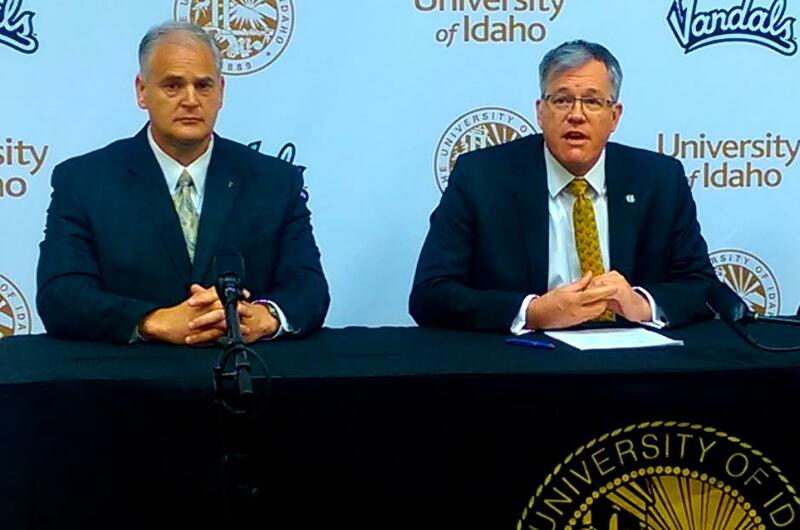 MOSCOW, Idaho – Uncertainty in leadership that has loomed darkly over the University of Idaho this year continues – for at least another few days. The Idaho State Board of Education, meeting in Boise Friday, deliberated the fate of Idaho athletics director Rob Spear for two hours in executive session but came to no resolution. “There will likely be another meeting next week,” according to Mike Keckler, the board’s chief communication and legal affairs officer. Spear was placed on a 60-day administrative leave in April by UI President Chuck Staben following social media accounts early this year from two former Vandals women athletes. The accounts said that five years earlier Spear did not adequately address their complaints that a former UI football player had harassed them and in one instance inappropriately touched one of the women. In parallel with Spear’s administrative leave, UI initiated an in-depth review of its policies for responding to harassment complaints. That review is ongoing. It was not finished when Spear’s leave was due to expire in early June, and Staben extended the leave indefinitely. In May, Staben and the board announced Staben’s contract would not be renewed after this year. Possibly because they decided to end Staben’s tenure, board members concluded that they – and not Staben – should decide whether Spear comes back from leave or is fired. Staben declined to specify what he recommended to the board, saying he could not disclose that because it was a personnel issue. “It is important to get this resolved,” Staben said. In Spear’s absence, Pete Isakson, UI associate athletic director/revenue generation and executive director of the Vandal Scholarship Fund, is serving as interim athletics director. Isakson has already hired one coach. After Staben told the board of education this spring that Idaho might have to cut women’s soccer to help eliminate an ongoing approximately $1 million deficit, coach Derek Pittman resigned to become coach at Texas San Antonio. The board gave UI officials a year to develop a plan to balance the budget. With soccer spared for at least one more season, Isakson hired Jeremy Clevenger, an assistant at Northern Iowa. After Idaho’s student government discussed calling for Spear’s firing in the wake of the former athletes’ complaints, Staben addressed an Associated Students University of Idaho meeting. Staben called Spear a role model for Idaho, but a week later at another ASUI meeting, he announced Spear had been placed on administrative leave. “We got some additional information that suggested that was the best course of action for the university,” Staben said. Published: July 13, 2018, 5:28 p.m. Updated: July 13, 2018, 7:59 p.m.